Not one but two drunks have relieved themselves here over this puffy omelet after what must have been a hell of a party. Thank you for the thumbs up, Susannah. This has been running for just a few days, but be assured that there is plenty more to come I know the recipe card site, and those cards are just ‘wonderful’. I was enjoying this site until this picture. Seriously stomach turning. Just disgusting. I’m appalled. Susannah, does Sanjay know you are looking at such awful abominations? You couldn’t say you were not warned. Only the boldest manage to esacpe the chamber of horrors unharmed. Oh yes, Josh, we’ve giggled over those horrifying recipe cards since we first knew each other as teenagers. Don’t worry—we’ve never been brave enough to try recreating them. 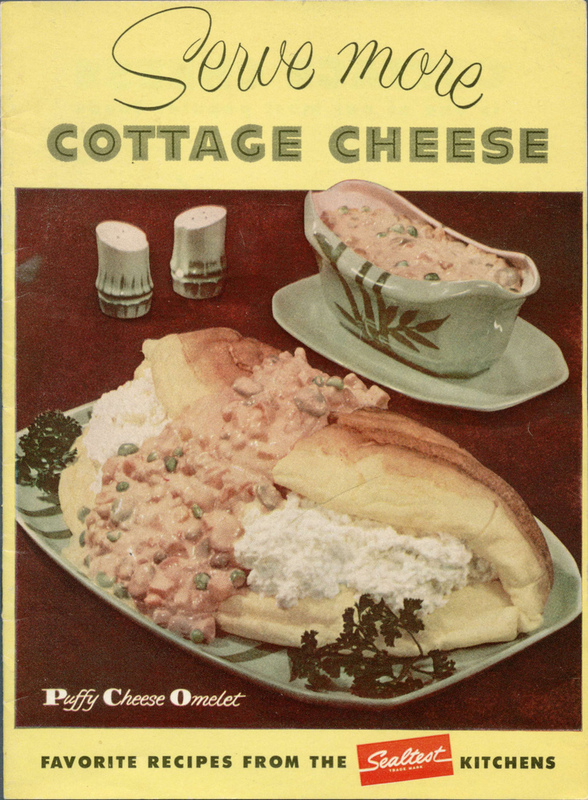 Who thought that vomit on a cottage cheese sandwich would look appetizing?! Yikes!